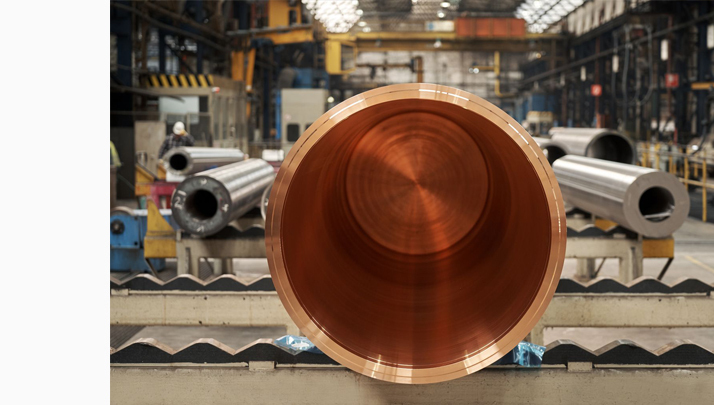 Vallourec produces huge copper canisters for long-term storage of spent nuclear fuel. The project was started in 2006, when Finnish customer Posiva Oy, an organization specialized in nuclear waste management, teamed up with Vallourec in the development and production of special copper canisters. These canisters - about 7 tons in weight each - are intended to form the outer shell of an "eternity seal" for used nuclear fuel elements. In May 2018, the 12-year R&D project ended with final inspections and documentation checks which were carried out successfully in the presence of the TÜV. Since the beginnings of the project, two or three canisters have been produced and tested by Vallourec each year in the framework of agreed ongoing test and development series. Ultra-precise design, perfect surfaces and flawless material properties are crucial to the long term function: Tightest tolerances are mandatory for the precise assembly of a cast iron insert inside the copper canister, the insert embedding the warm fuel rods inside its channels. The inner walls of the copper canisters are slightly textured for even heat absorption by the whole canister surface. The design of the nuclear waste canisters also takes advantage of Vallourec's unique pierce and drawing processes at the Reisholz facilities, in Germany (Land of North Rhine-Westphalia), out of which the tube comes with an integral bottom. After the cast iron insert has been closed with a steel lid, the whole canister will be "sealed" by a welded copper lid. Copper had been chosen as ideal material for the outer metallic shell due to its excellent corrosion resistance. Under the given conditions it will ensure the tightness of the canisters for much longer than the period of 100,000 years, which is required for the long-term disposal of radioactive material in Finland. The design of the canisters is part of a disposal concept that has been developed on the basis of the specific geological conditions in Finland and Sweden. The repository under consideration is situated some 450 metres deep in a tectonically and geologically safe granite bedrock spot that has been in a geologically unchanged condition for 1.8 billion years. Precise holes for the canisters will be drilled into the granite, and these holes will be filled with bentonite clay for protection against mechanical wear of rock, before the canisters are finally injected.